One of the oldest refuges in the region, located in an enchanting place! 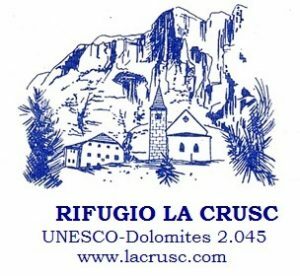 Welcome to the La Crusc Refuge! The Santa Croce refuge in Badia is located in a beautiful setting, at the foot of the “Sas dla Crusc”. Whether it be winter or summer, the colors of nature completely change the landscape, constantly turning our refuge into a new experience that involves all the senses!! The refuge boasts a family tradition that has been ongoing for 5 generations. Our restaurant, which is open all day, offers our specialties ready for you to taste, including the famous Kaiserschmarren with blueberry jam, eggs with speck and potatoes and polenta (cornmeal) with cheese and mushrooms. Our Bar – Restaurant will open on the 8th of June until the 6th of October 2019. From the 15th of June to the 30th of September there is also the possibility to stay overnight. We wait for your visit and to try our delicious plates!! Check out the new 360 webcam! So, even when you are back home, you can dream and feel with your imagination, like back on holiday. Wonderful view of Sas dla Crusc mountain and of Santa Croce mountain hut and Church. Click and check it out!! During the summer season many pilgrimages take place. We have also a new phone number! When we are not reachable on the old one, please call us on: 0039 0471 839874! The Kaiserschmarren, or rather the ‘the Emperor’s omelet’ is a typical sweet dish. It’s a sort of crepe that is slightly thicker and soft, cut up into pieces and covered with sugar. It’s served with cranberry jam and is eaten either as a single dish or as a dessert to be shared.